July 1-August 6 Blue Moon Horoscope. 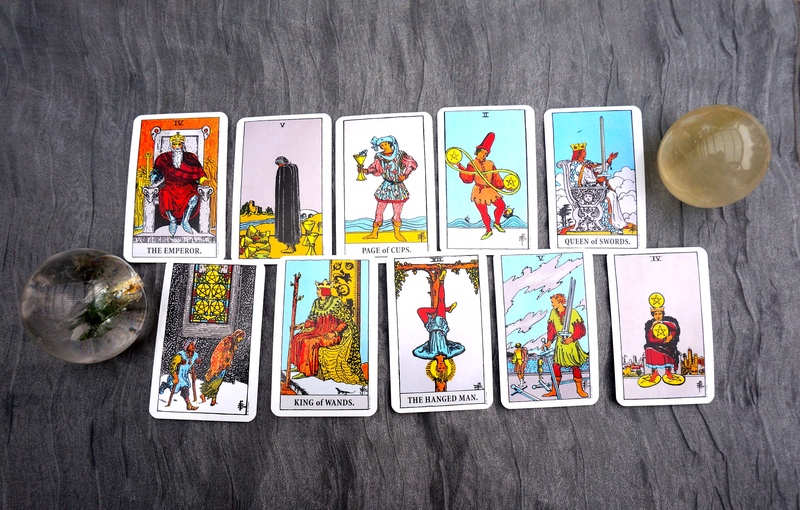 The top row of card represents each week/phase of the Moon and the bottom row provides additional information on each week. Enjoy! We’re all coming into a wave of change that will take us through the next two and a half years. It’s a Blue Moon – or two Full Moons in one month. July’s first Full Moon on the 1st of the month (9:22pm CDT), is usually called the Antler Moon or the Thunder Moon. This fits with the never ending stream rain we’ve been having in Central Texas recently! July’s second Full Moon on the 31st (5:45am CDT) is the Blue Moon. Spirit has asked me to share a Blue Moon Horoscope Reading with you so that we can all take July 2015 to prepare for the new 2 1/2 year cycle beginning with the Blue Moon on the 31st. This Blue Moon cycle will end in January 2018. Where do you want to be in your life by then? Let the Blue Moon, Spirit, and the Universe provide their support and love. Next month we’ll get back to the regular sun sign horoscopes, but for now — the Blue Moon! 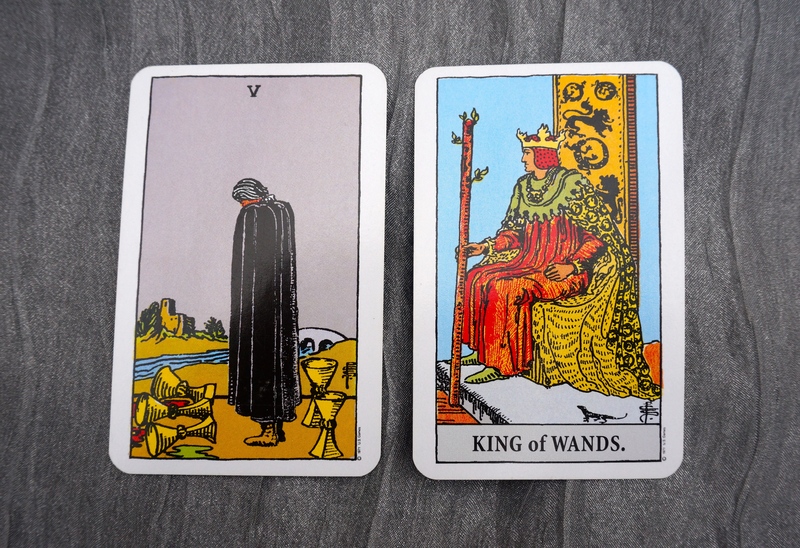 In this reading, there are 10 cards. The first 5 cards (top row) are the general energy of each week. 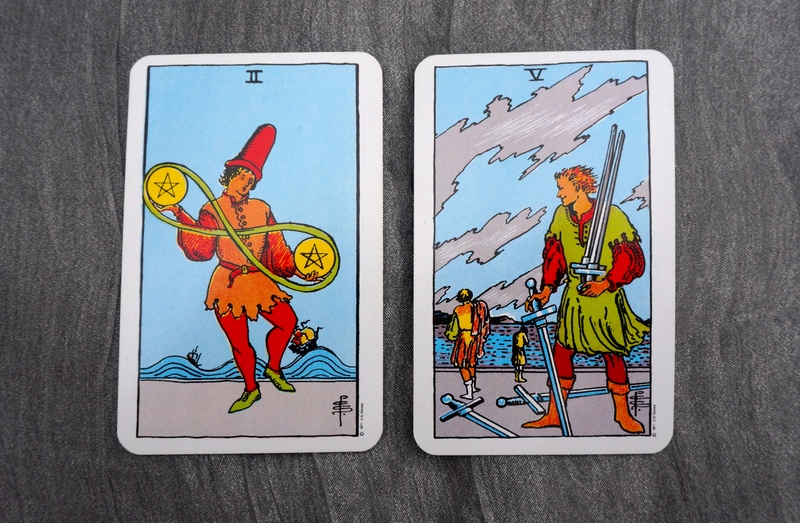 The second five cards (bottom row) provide guidance on that energy. The shifts in the energy for each week have to do with either letting go (waning energy) or building up (waxing energy). In this First Full Moon, it’s time to take a moment to appreciate where you are. Know that you no longer need the old supports. You no longer need the old patterns, the old energy, the old mentors, the old way of doing things. You have come to an end of a cycle. Mastery earned by you in developing your sense of ethics, what’s right in your world, and your relationships with others in your home and/or work spheres, is the basis for the next Blue Moon cycle. Thank and release your mentor. This mentor could have been an older individual in your life, but mentorship can also occur through relationships with peers, Loved Ones on the Other Side, or even learning through watching your peers bumbling along and making mistakes, thus teaching you what NOT to do! If you try to hold on to your mentor (either literally or figuratively), you may struggle because you’ll be stuck doing things the old way. The person can still be in your life, but it is time to take ownership for your accomplishments and path forward. In making this shift, you will be able to begin a new period of creative and financial growth. The waning moon tells us what we need to let go of in order to grow. 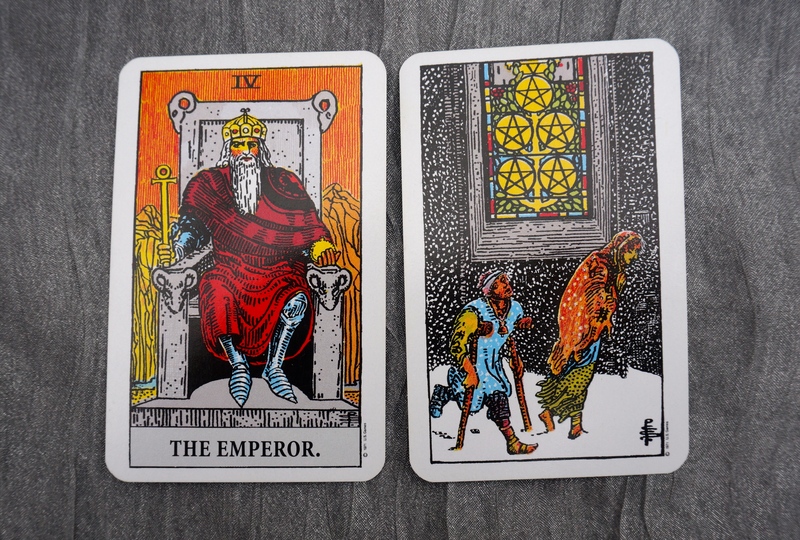 As you’ve come into your own power through the Emperor in the First Full Moon, it is time to reassess your relationships with those around you. Bring people who share your passions and dreams even closer. Start seeing less of those people who interfere with your best interests. Even if these negative folks are not malicious, you will be held back if you keep trying to change them. Bless them, mourn them if you wish, and let them go. Remember that you are at the brink of becoming positively powerful in so many parts of your life! It is time for spiritual and emotional ascension. This is also a time to start thinking creatively. It is time to kindle new passions and dreams. Do you want a better job? A new love interest? To find your soul mate? To burn away a health issue or let go of excess weight? Or to feel surrounded by those who love you in a comfortable home? Now’s the time to put the picture together of what you want. Start thinking big, trying on the “movies” of where your life could go in the next 2 1/2 years. The New Moon is the birth of potential. Last week you remained in thought to dream up your future lover, smoking hot body, successful career, and/or joyful family reunion. Now is the time for action. Now is the time to start building new relationships and strengthening old ones. Now is the time to up the romance with your partner if you’re coupled. If you are single and want a partner, now is the time to tell everyone you know that you are finally ready to be set up on that blind date. Positive messages will appear from unexpected places, so it’s time to reach out NOW. The same applies if you’re looking for anything that’s close to your heart—starting a business, getting medical advice for a loved one, etc. NOW is the time to reach out to who ever you can think of to get new information. If you don’t do so now, it could take much more time to accomplish the same ends. 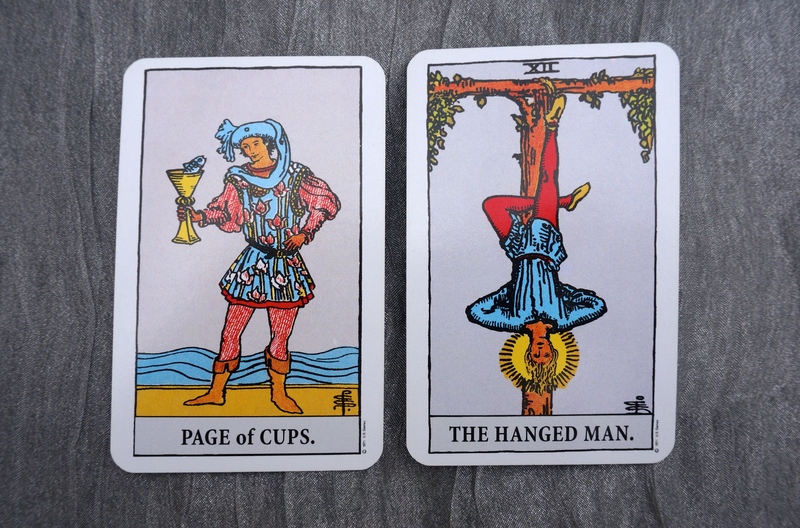 If you don’t go out on that blind date when it comes—you’ll be stuck in the same place you’re currently at, just like the hanged man. He’s content, but he’s not going anywhere. So, it’s up to you to decide. The 1st quarter is a waxing moon, a time of growth. Make sure that as you forge ahead, you take good care of yourself. Have due diligence if you’re trying to make any changes related to spending money or changing jobs. But, don’t overdo it. Don’t over think it. You will be provided with the information you need if you ask for it. Remember that if you can keep your spiritual, financial, and emotional life in balance, that the Universe will provide for you. Start with small beginnings—there’s great potential to get what you want if you keep faith. Know that your dream isn’t always the same one that your friends or family have. We all have our own dreams. But, if you sharing your dream for the next 2 1/2 years and someone pooh-poohs it, stop telling them about it! Keep your energy up by sharing your dreams with like-minded people. 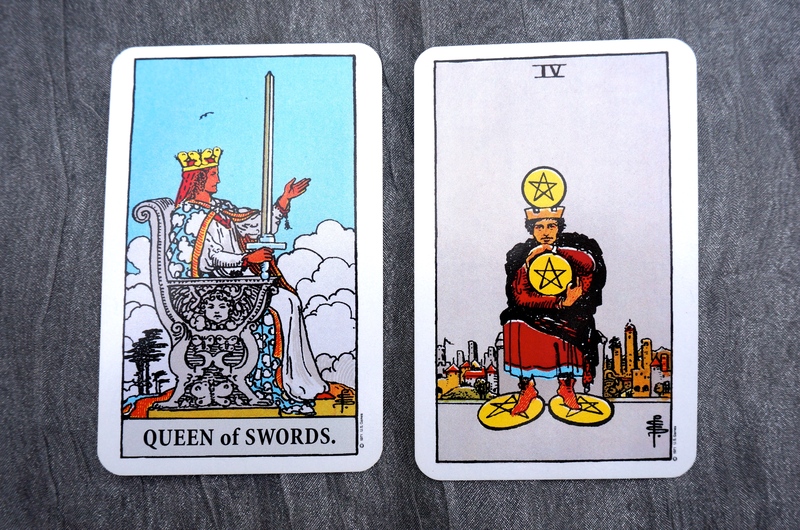 The Blue Moon card is – The Queen of Swords! By now, your dreams and goals for the next 2 1/2 years should be well in hand. You’ll have a sense of “done”-ness to your dreams. They will start to feel possible at this point if they did not before. The Queen combines the best of our feminine selves—emotion and relationships, with our masculine selves as expressed through the swords—reason, justice, and intelligence. We cannot move forward unless our heads and hearts are brought together. The 4 of pentacles is here to let us know that we’ll be building on a successful, stable foundation as we move forward. This is a longer cycle, so the 4 gives us financial and creative support for the long haul. Remember to share your upcoming successes with others as this will expand your joy, love, wealth, and passions exponentially. 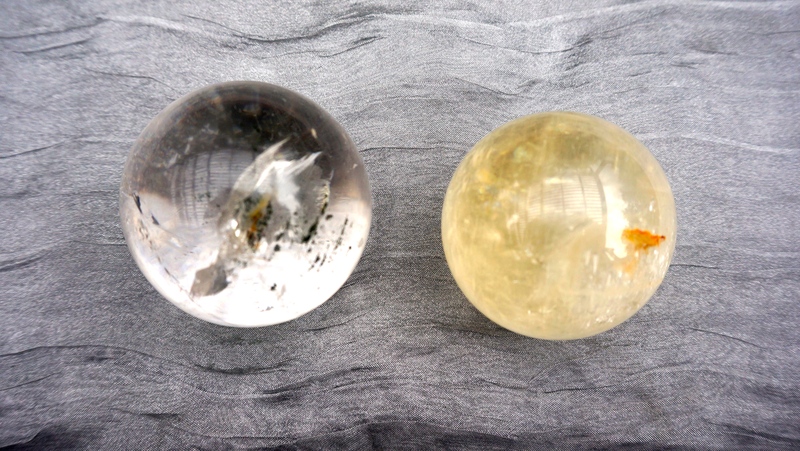 Two Moons – one of Clear Quartz, the other of Calcite. This entry was posted in Tarot/Horoscope, Tarot/Oracle and tagged Austin, Blue Moon, Blue Moon Tarot Horoscope, Christine Linial, psychic on June 23, 2015 by christinethepsychic.